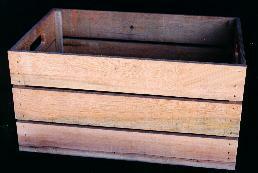 Our versatile wooden crates are carefully handcrafted from resawn Douglas Fir. in Western Canada. All crates are glued and nailed for superior strength and durability. Crates have been carefully designed to work together to create that Old World marketplace atmosphere. Chamfer cut handles for easier handling. Drops into BT910 Full Size Crate to give less depth, with same full look. 22" L x 14" W x 11.5" H x 3.625" display depth and angled 30 degrees. Will stand on top of BT910 Full Size Crate or BT911 Half Crate. Full size crates can be stenciled or branded with custom name or logo at additional cost. Grocery Displays Next Page !